The prodigious number of vending machines in Japan amply proves the country’s craving for convenience, but it could be argued that the current fad of forcing anything and everything into a can is a considerable cause for concern, especially when the newly tinned treat is then transferred to the aforementioned roadside dispenser. Which, if nothing else, leaves less space for essentials such as cigarettes and alcohol. 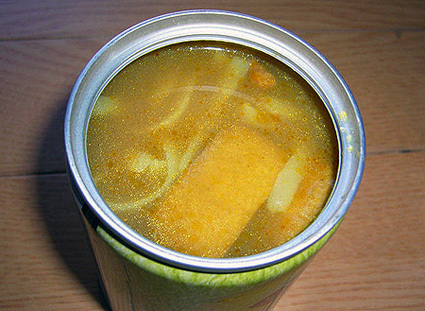 Social habits aside however, Oden in a can was sort of fun for a while, and the far from freshly baked bread is strangely fascinating. 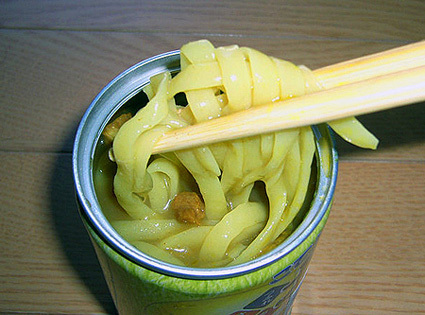 Tinned ramen on the other hand seems like a step too far, and the newly introduced Udon definitely is. No two ways about it. 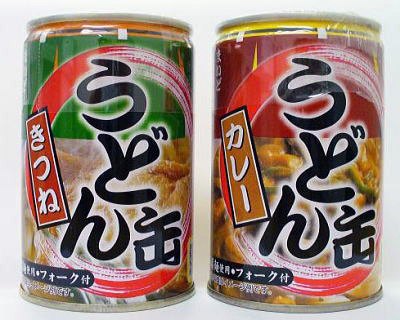 Ok, the can looks nice and colourful, and there’s a choice of of either kitsune or curry. But pop the little beauty open, and suddenly McDonalds merits a mention in the Michelin Guide. Should you really want to try some though, it’ll cost you either 300 or 350 yen. The curry version is more expensive for some reason. I would in fact eat this if in a pinch for cash. In fact, I would even stock this stuff in case of emergency! Mmmmm…. Udon. Reminds me more of chicken noodle soup in a can than curry udon lol.